When you hear the word ‘learning’, what images come to mind? Do you see learning related to books, numbers and academic activities or do you see it as an informal process associated with games, toys, exploring and fun, or perhaps even a combination of all of these? Your response will be determined by your own experiences and understanding of learning. Some adults may see play as a fun experience but not one associated to academic achievement. When play happens in an educational context, some adults may feel this interferes with formal instruction. They see a disconnection between play and improving the child’s academic results. They may hold the belief that play should be left to recess breaks and out of school activities. Some educators also consider play as being a separate activity known as ‘free time’ and separate to the curriculum. This is a huge misconception about how we learn and educate successfully. Learning through play is one of the richest experiences people of all ages can have. Remember when you learnt how to ride a bike and all the attempts you made to finally ride without falling over and grazing your knees? What about when you purchased your first smartphone and you played with all of the features to learn how to use it? How is it that you still remember what to do? What was happening in the learning process? Through play, you have the opportunity to be autonomous. You have the freedom to learn. When you are in the moment of play, you are in the ‘flow’. This signifies you are in the moment where nothing else matters. It is the optimal experience. You are totally absorbed by the activity. Mihaly Csikszentmihalyi calls this an autotelic experience (from the Greek words ‘auto’ meaning self and ‘telos’ meaning goal or purpose). In this experience intrinsic motivation occurs where the experience is the reward itself. You are motivated and completely engaged which occurs in the moment of play. Interestingly you are learning yet you many not even realise it. 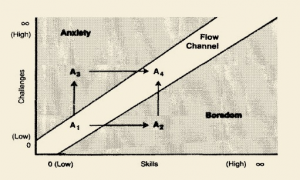 Csikzentmihalyi’s Flow Channel diagram below illustrates how skills are developed even as challenges increase in the moment of flow. 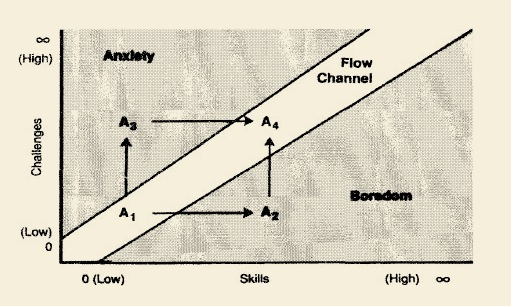 Interestingly the diagram also separates anxiety and boredom from the moment of flow. The arrows indicate how we can move out of flow into anxiety or boredom but still aim to be back in the flow where optimal learning happens and motivation is heightened. Who would want to be bored or anxious when they can be in the flow of the experience and in a more positive state? Interestingly when you are in the ‘anxious’ zone, to get back into the flow you need to increase your skills. To return to the flow in a ‘bored’ state you need to make it more challenging. Something interesting to think about in many learning contexts. Csikszentmihalyi, M (2002). “Flow: The Classic Work on How to Achieve Happiness.” Rider, London. Through play, you have the opportunity to stay within the ‘flow’. If what you are playing enables you to autonomously learn, increase your skills and experience challenges that are within your zone of proximal development then the potential for you to learn is enhanced. Education is seen as a formal learning process where someone imparts knowledge onto someone else. The advantage educators have is that they are able to create learning spaces that allow students to play and learn many concepts to develop their skills and understandings. With the concept of flow in mind, this experience can escalate into an engaging and worthwhile activity far beyond the traditional ‘chalk (or whiteboard) and talk’ session. Next time you see a student in a classroom engaged in a play experience, whether it is structured by a teacher, self-directed or a combination of both, observe what the student is doing and ask yourself, what are they learning? When a child picks up a digital device and they decide to play a game using this device, can you now understand that they have the opportunity to learn using this game? For example think about the Minecraft game. Did you realise how many skills this one game develops? 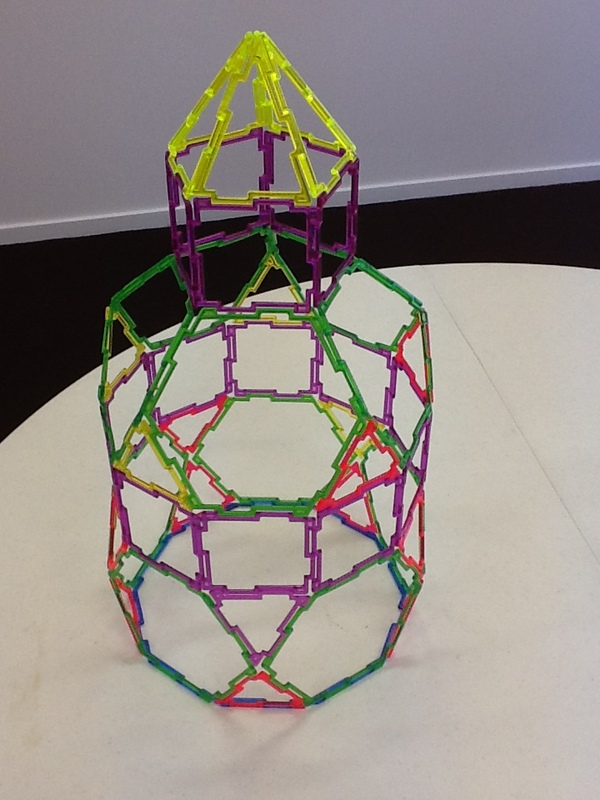 Skills include Problem Solving, Concentration/Focus, Goal Setting (and working towards completing a set challenge that is transferable to real life situations), Digital Citizenship, Teamwork and Collaboration, Creative thinking, Visualisation, Constructing complex buildings (this can also relate to 3D shapes and Geometry), Distance, Time, Measurement, Survival…the list goes on. We can also develop rich learning experiences by encouraging students to play together and solve problems. This could be using all sorts of resources including ones where they can manipulate letters, words, numbers, patterns, shapes and learn fundamental literacy and numeracy concepts at the same time. By playing together they also develop their vocabulary and improve their oral literacy which supports effective writing and reading acquisition. 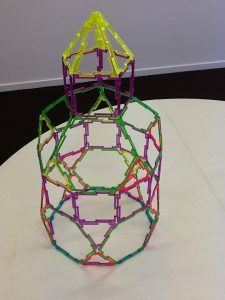 I remember recently when I gave a child the opportunity to play with 2D shapes that interlock to create 3D shapes, he created a highly sophisticated 3D shape (see below). He experimented with different pieces to discover which ones tessellated. He challenged himself to create an authentic shape rather than a standard one. If I had told him what to build and how to do it would this have had a different effect? Would he have been in the ‘bored’ or ‘anxious’ zone instead? As educators, if we seek ways for students to play we are maximising their learning, keeping them in the flow and allowing them to learn far more autonomously. Playing to learn is a powerful educational experience. Collaborate with your students to find ways to do this more often in your classroom. As a parent look for ways to engage your child in meaningful play experiences within and outside the home ensuring there is a balance between screen time and face-to-face play time. Change your paradigm if you did feel that play didn’t have a role within the classroom and see it is an essential part of it.